In the midst of my training for the QC International Marathon, I have received an invite from Mr. Jovie Narcise (aka baldrunner) to join the PAU T2N (Tagaytay to Nasugbu) 50K ultramarathon. I was honored and felt that I was considered to be ready to do this race. I have been doing long runs with my team (Gone Running Club) on weekends and we have done a 40km LSD 2 weeks before the PAU 50k race. That basically builds confidence that I can finish the race. Together with my buddy Jay, we both registered for the event and would log this as another milestone in our running career. It was a cool sunday morning in Tagaytay City where we all gathered at the start line. Happy to see familiar faces, and knowing that it was an ultramarathon, I knew that all runners have prepared for this race and have pure will and determination within them. Jay and I were among the newbies and we were glad to be part of it. There were about 160 runners who participated the race and I learned that 159 have finished. We decided to set a target time of 6:30 for this race. The first 35km was a good run as we were able to increase our pace and we were ahead of our target time. However, from then on I felt my heart rate has reached probably 90% or more and it was difficult to recover. I had to run and walk which obviously slowed as down. At 39th km, I told Jay to run his pace as I can't maintain a 6:40 min/km pace, and that we see each other at the finish line. It's 11km to go and in my mind I knew that I can finish the race, no doubt. I slowed down a bit, but I have another focus, my 42k split. Yes, I had a new Personal Record on my 42k, I logged 4:58 (my first marathon was 5:47). I was smiling as for me its another milestone of improving my time for a marathon. As I move on for the next 8km of the race, I managed to recover my breathing and heart rate was at a comfortable level but I was struggling already due to leg fatigue. More walk breaks for me. In the last 5km, I started to pick up some pace and mindful of my target time, but at this point I noticed that my garmin hanged and I was now totally blind of the time and pace. As I saw the Jollibee signage saying last 3km, I began to focus and and avoided walk breaks. 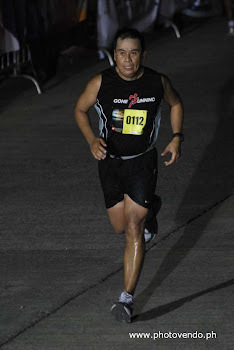 The finish line was at the Nasugbu City Hall which was near the Jollibee Outlet. As I saw the Jollibee sign, I was too eager to get there the soonest that I can, but it seems to be the longest 1-1.5km of the race. I saw one of the bald runner marshalls and guided me to the final turn reaching the finish line. It was yet again another memorable moment as I have tested again my limits on this race. If you put your mind to it and prepare for it, you will achieve whatever goals you have envisioned. Keep raising the bar and believe in yourself. There's a long way to go, keep it one stride at a time and try to make a difference. Thank you to team bald runner and PAU. It was a good race and a good experience. Looking forward for more PAU races in the future. 50km done! My longest run so far..
with Jay and Sir Jovie (baldrunner), I finished in 6:12:48 and 65th out of 159 finishers, Jay finished 5:52:50 at 51st place.